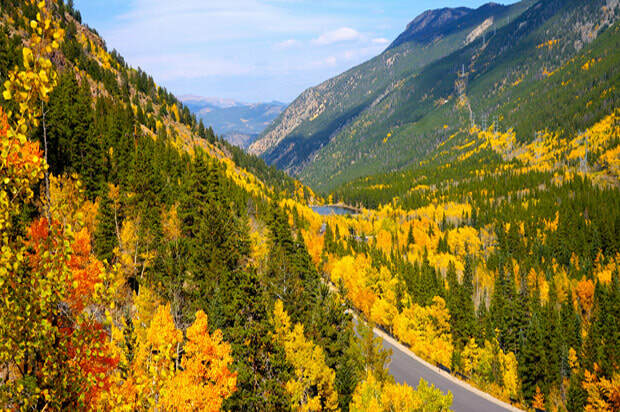 The main feature, just minutes away is Guanella Pass – a scenic mountain drive that reaches an other-worldly landscape at 12,000 feet. Here, several creeks flow beautifully through aspen groves before reaching spectacular mountain views. You may even spot our state animal, the big horn sheep. This road brings you to Georgetown, where you have access to more activities & sightseeing along i-70. Guanella is most popular during the Aspen Peak, late-Sept through early-Oct and is open Memorial Day through the first big snow (around late-Nov). When the Pass is open, try the Wild West Day Trip. There is still a small waterfall (at the first switchback) and nice views along that pass that are accessible all year round. In winter, you can also still reach Georgetown/i-70 via Evergreen. You are truly off the beaten path at The Hygge Chalet! The chalet is just off of Highway 285 in Grant, CO. This road is well-maintained in winter and runs along the old train route. Most of the little towns along the way have their own interesting history. Make sure to say "Hi!" to our friends at the ​Shaggy Sheep, the perfect place for a mountainy breakfast or lunch and only a few minute down the road. In Bailey, stop by the Coney Island Hot Dog Stand, the Sasquatch museum, enjoy the many river spots for picnics or fishing. There are also plenty of trails nearby for easy walks, hiking, or snowshoeing. ​For kids, Tiny Town & Railroad is an excellent stop. This is an incredible drive and you'll pass through historic Jefferson and South Park. Check out the Collegiate Peaks Scenic Byway to see a collection of fourteeners, try one of the countless adventure activities, including whitewater rafting. Visit the Mt. Princeton or Cottonwood Hot Springs, check out a ghost town nearby at St. Elmo, taste whiskey at the Deerhammer Distillery, walk main street, try the House Rock Kitchen. There are also multiple trail options in the area, as well as many easy community trails. 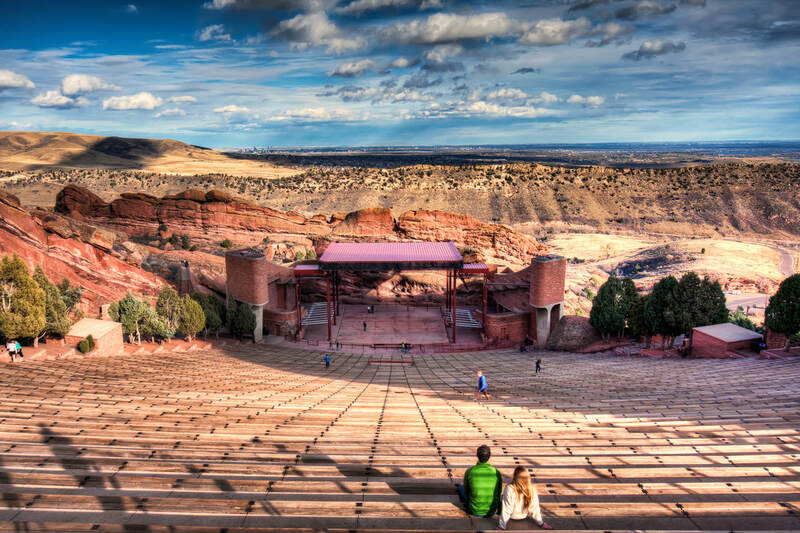 The Red Rocks Amphitheater is on the way to and from Denver and can also be a quick stop on the way to other adventures, so it's easy enough and absolutely worth a visit. The entire park is open to the public all-year and closes a few hours before a show. Stand on the stage, walk the crazy steps, take one of the beautiful trails within the park, or visit the museum to learn the interesting history. The area is surrounded by spectacular views and giant red rock formations, reminiscent of Utah. During a concert, you can easily hear the music from the surrounding hills. There is also Film on the Rocks all summer long with a concert and a movie for less than $20. If you plan well in advance, you may even catch a show -- or plan your visit around one! A concert here is unforgettable! Dinosaur Ridge in Morrison is a great stop for kids and adults that want to hike a trail out to prehistorical fossils, including massive dinosaur tracks. Click here for details on one of the Best Self-Guided City Walks! ​Museum. If you feel like biking, sign up for B-Cycle with pick-up & drop-off all over the city. Click here for places to eat and drink. More ideas can be found at Denver.org. Visit one of America's Foodiest and Healthiest towns! There is a lot to see and do, especially if you love food, beer, or hiking. Hang in Downtown Boulder, where you can walk the pedestrian-only street along Pearl Street Mall, stop in the many unique shops, try one of many award-winning restaurants, have a craft beer, check out the Shambala or Boulder Theater. Make sure to snap a picture of the iconic Flatirons of Chautauqua. Scramble on the many boulders along the Sanitas Trail (idyllic, but busy), or hike any of the other Amazing Boulder Trails. Boulder also has B-Cycles with pick-ups and drop-off all over. Pro-Tip: Take Baseline Rd past the Flatirons into the foothills and park at Lost Gulch Overlook for an amazing & expansive view of the area–all the way to Rocky Mountain National Park and Denver. There are also great hiking trails in this area. Golden is another Old West mining town that sits along the foothills. It is home to Coors Brewery, which offers tours (be sure to book ahead). The main street has lot of little shops and places to eat. Or take to the trails with boots or snowshoes at Golden Canyon State Park or the North Table Mountain Park for panoramic views. For the museum enthusiast, check out the Colorado Railroad Museum, the Clear Creek History Park to experience the true Old West, or the Colorado School of Mines Geology Museum for moon rocks and other amazing features. 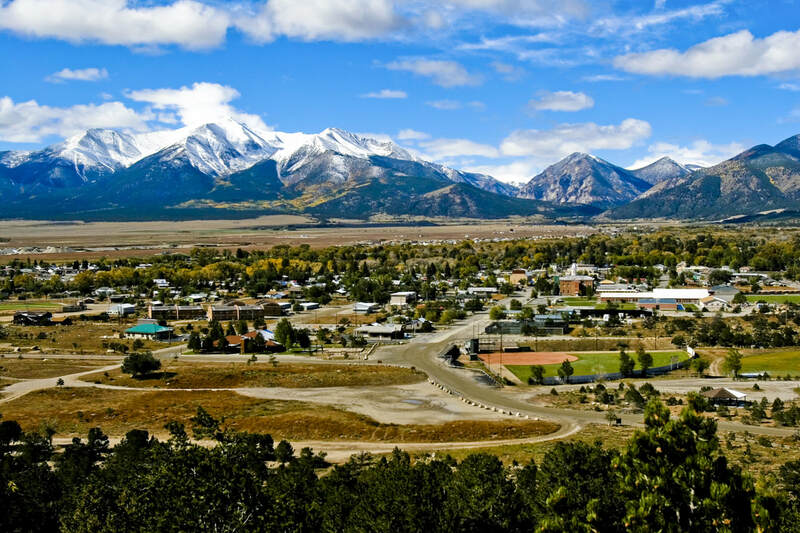 Located right in the heart of the Rocky Mountains, Salida boasts a hopping, historic downtown, with great restaurants, bars and shops, all just steps away from the peacefully flowing Arkansas River. Beyond downtown, enjoy great biking, hiking and rock climbing, among other outdoor pursuits, like rafting and zip-line. Or just hang out at the lovely Riverside Park. Salida has been considered one of America’s “coolest small towns” and is also a Certified Creative District, where you can check out a vast array of art galleries or enjoy the Art Walk in summers. It also has the largest indoor hot spring pool in America with private soaking pools. Mount Evans Road is the highest paved road in America. If you've never stood on a 14,000 foot peak, this is your chance. You're sure to spot lots of wildlife and unbelievable views. While the peak is only open during summer, some of the road is open all year round and quite often, the last 3 miles can be hiked! Mount Goliath is a mountain peak section of the Mount Evans area, offering a trail that winds through subalpine and alpine areas. This is a trail of contrasts — awesome Rocky Mountain vistas of Great Divide peaks; delicate floral treasures; wind-sculpted, ancient bristle cone pines; cold summit winds and gentle summer breezes. There is also a Denver Botanic Gardens Natural Area here worth visiting. 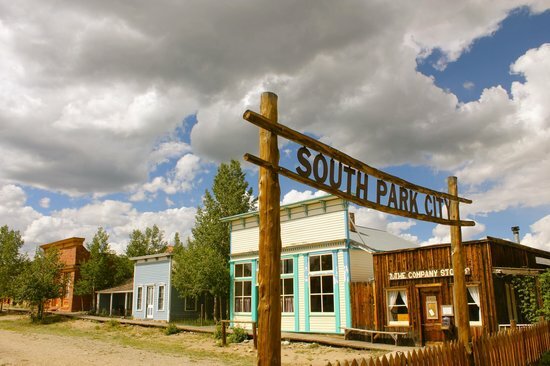 Yes, South Park is the town that inspired the show and if you're into there is a sign for that. But this is still a cool place to visit and is just a short jaunt over Kenosha Pass. This area of Colorado is spread over huge alpine plains and is a great spot for adventure and activity. The drive alone is worth the car time all year round. Don't miss the South Park City Museum, a remarkable, "living history" restoration of a 19th century Colorado mining town. Horseback ride through amazing country with Platte Ranch Riding Stables​. Or just make little stops for photos and shops along this beautiful part of 285. Georgetown is a delightful Victorian village set in a spectacular mountain valley with 200 restored buildings from the 1870s. The main street is lined with shops and restaurants, and many of the old homes have been turned into antique stores. The Georgetown Loop Railroad takes riders on narrow-gauge steam locomotives curling down a mountain ledge, at one point crossing over a 90-foot-high trestle. ​Georgetown (1.5 hours) – A true Colorado mountain town with great little shops and nice places to eat. There is also an old steam train you can ride that runs along the original mining tracks. 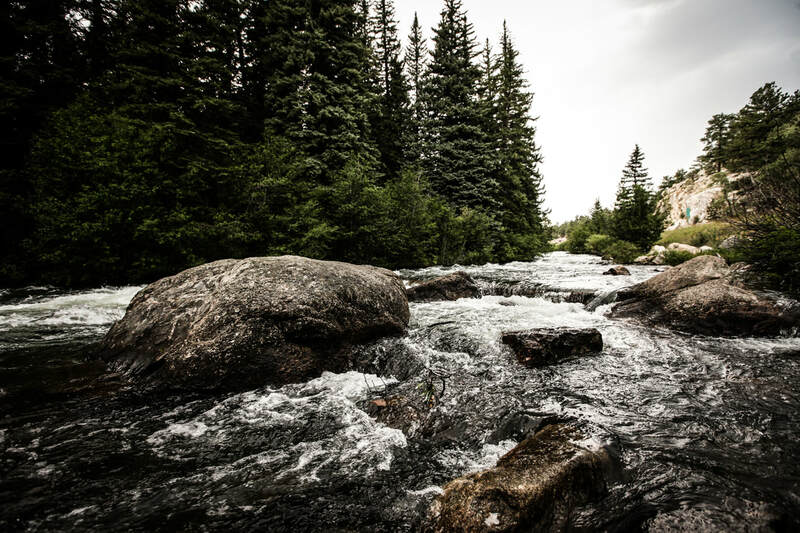 A beautiful little drive just off 285 will take you along the Platte River to Pine, a charming mountain town that will remind you of days gone by and is surrounded by picturesque views and incredible large rock formations. And don't miss the turnoff for the legendary mountain town bar, the Bucksnort Saloon, which started as a Mercantile in 1800 and now hosts friendly bikers and curious tourists. There is also plenty of hiking, fishing, and recreation at the Pine Valley Ranch Park. Breckenridge is where to head for skiing and snowboarding, but there is plenty to do here even if you don't want to ski, but want the experience of a Colorado ski resort. There is an unbelievable list of things to do all year round round. The main street is a great place for hanging out and is especially beautiful when lit up during Christmas-time. In an easy, 40-minute-or-so drive, you can escape to the pine-scented mountain town of Evergreen. A lovely alpine lake is located right in town, with lake activities in the summer and ice skating in the winter. The picturesque downtown is tucked between rocky canyon walls and offers a promenade of shops, galleries and eateries. Spend the day hiking beautiful nature trails, touring small local museums, or catching a local theater performance. Just a short distance from Evergreen, experience the Wild West in Central City where you can gamble away, visit the Nevadaville ghost town, or take a Hidee Mine tour (open all year round) and mine for real gold! The Florissant Fossil Beds National Monument is a fascinating place to visit. This monument is a portion of an ancient lakebed that has preserved almost in its entirety, an ecosystem that existed 35 million years ago. Leaf, insect, and seed fossils can be found throughout the 6,000-acre monument. Don't miss the Petrified Forest Walk, a one-mile trail that passes massive, petrified Redwood stumps, an historic excavation site and a geologic timeline exhibit. While you're in the area, stop by and support the wonderful work being done at the Wolf and Wildlife Center where you can pet wolves and foxes. Or horseback ride with M Lazy C Dude Ranch. A bit of a drive, but worth it! At 10,000 feet, Leadville is the highest incorporated city in America and overlooking it are the 2 highest fourteeners in Colorado. If you’re really into the history of the Old West, this is also a great place for that. The town also boasts great antique and mountain gear shopping, a great train ride, and sleigh rides in winter.